If a debtor meets certain income based requirements under the bankruptcy means test, the debtor may file for Chapter 7 Bankruptcy. Under a Chapter 7 Bankruptcy, the debtor liquidates their non-exempt assets and in exchange is able to discharge their debts, including delinquent assessments, for a fraction of the amount owed. Although the debtor is required to liquidate most of their assets, certain assets including a primary vehicle, work-related tools, basic household furnishings and other necessities are exempt, meaning the owner is not required to sell the assets to pay creditors. Chapter 11 Bankruptcy is a form of bankruptcy involving the reorganization of a debtor’s business affairs and assets, and is generally used only by businesses and high net worth individuals who require time to restructure their debts. As such, it is often a complex and costly process requiring the debtor to act in accordance with a plan of reorganization. Although an association is more likely to be involved in a Chapter 7 Bankruptcy, an association may become entangled in a Chapter 11 Bankruptcy when a corporation or other entity holds title to one or more units. Chapter 13 Bankruptcy allows debtors to pay off their debts in accordance with a “payment plan” generally lasting from 3 to 5 years. The debtor is allowed to retain their property, and creditors are prevented from attempting to collect on the previously incurred debt. The debtor is liable for post filing debts, in addition to those payments required under the payment plan for pre-filing debts. Accordingly, an owner is still required to pay post filing and pre-filing assessments to the extent imposed under the payment plan. It is important to note that when dealing with a Chapter 13 Bankruptcy, an association may be entitled to a greater payment over other unsecured creditors if the delinquent assessments are secured by a lien on the owner’s property. Under all forms of bankruptcy, an automatic stay is imposed upon filing. This means that all collection efforts by an association must cease immediately, including: 1) demands for unpaid fees, fines or assessments prior to filing, 2) suspensions of the owner’s privileges, 3) recording of liens against the owner’s property, 4) foreclosing on existing liens, and 5) the filing or continuation of ongoing lawsuits against the owner. The automatic stay continues until the bankruptcy proceedings end or the court sets aside the stay at the association or other creditor’s request. An association’s failure to comply with the stay may result in liability for both actual and punitive damages. When an owner files for bankruptcy, their debts are categorized as either pre-petition or post-petition debts. Only those debts categorized as pre-petition (accrued prior to filing for bankruptcy) are affected by the bankruptcy. The owner will still be liable for paying post-petition debts (debts incurred after filing for bankruptcy), and the association may continue to send bills related to those debts. However, unless the association files a Proof of Claim with the court within the specified time, the association may lose its ability to recover any pre-petition debts. Accordingly, it is important for associations to file a Proof of Claim immediately upon learning that an owner has filed for bankruptcy. When an owner files for bankruptcy, their obligation to pay pre-petition assessments and the association’s ability to seek payment for those assessments is effectively destroyed. However, if prior to bankruptcy the board has recorded a lien against the owner for delinquent assessments, thereby securing that debt against the equity in the owner’s unit, then that debt becomes non-dischargeable. Consequently, assuming no other creditor forecloses on the unit beforehand, the association will be capable of recovering the debt when the property is sold. It is therefore important that associations promptly record liens against owners who have a history of delinquency with respect to assessment payments. 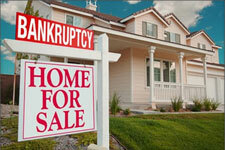 An owner’s decision to file for bankruptcy can have a significant impact on an association. Upon imposition of the automatic stay, an association is prohibited from any collection activity directed at pre-petition assessments, and must immediately file a Proof of Claim. Improper attempts at collecting debts accrued prior to filing could result in an association being liable for actual and punitive damages. In order to protect their interests, associations should be diligent in recording liens against homeowners who have a history of delinquent and unpaid assessments, thereby making those debts non-dischargeable in bankruptcy. As each bankruptcy is unique to the owner and association involved, it is important that Boards contact their legal counsel for advice and direction as to the appropriate course of action.